At just two years old, the PlayStation 4 and Xbox One haven’t yet hit their prime but that doesn’t mean Sony and Microsoft aren’t already thinking about their successors. In fact, most are certain that development of the tentatively-named PlayStation 5 and Xbox Two is already well under way. The typical lifecycle of a premium console is around seven years in the mainstream and another three years or so before being put out to pasture. 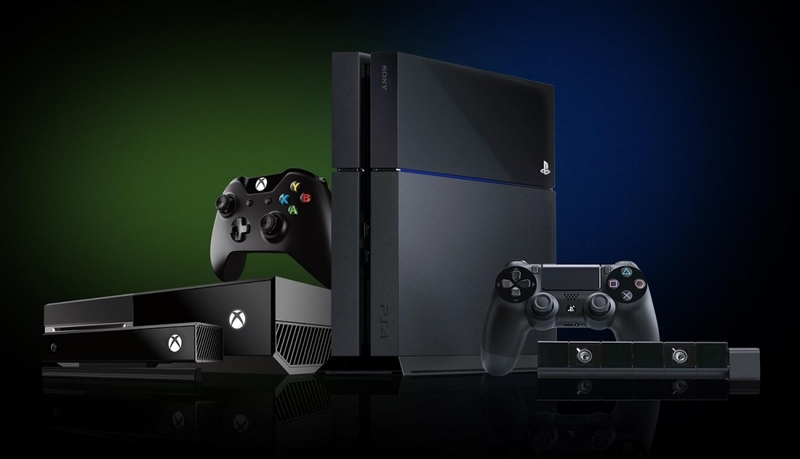 The next consoles from Sony and Microsoft, however, are expected to break this cycle and arrive ahead of schedule due to a number of factors. Unlike the gimmick that was 3D technology, 4K resolution is already on the path of becoming the next big thing. Despite the slow content rollout, we’re already seeing prices drop on 4K-compatible televisions; even mobile devices are moving toward the standard. Simply put, today’s game consoles don’t have the raw horsepower to support 4K gaming. Another key driver in the need for faster hardware is virtual reality. Earlier this year, Oculus VR revealed the high-end PC hardware that’ll be needed to run the company’s virtual reality headset. Today’s consoles don’t stand a chance, especially if they’re to offer a 4K virtual reality experience. Word on the block is that AMD is tempting Sony and Microsoft with hardware that offers five times the performance of current consoles per watt. Both the PlayStation 4 and Xbox One use custom AMD hardware based on the Jaguar microarchitecture. As Geek notes, this allowed Sony and Microsoft to move to an x86 architecture which simplifies game development. Assuming they once again take AMD up on their offer, backward compatibility shouldn’t be a concern as they’d still be running on the same x86 architecture. We don't need consoles anymore, just better PC games. wastedkill, Tibeardius, H3llion and 1 other person like this. No 4K please, make 60fps 1080p first. Promised since ps3 and xbox 360 and still waiting. SantistaUSA, TopSliceofBread, Billybobjoey and 2 others like this. The consoles were never intended to be upgraded, aside from storage which is one thing. So the fact this is a possible rumor, is no surprise because didn't Sony discuss upgrading the GPU? It was only decided not to as to not split the console install base, since they currently hold the lead more or less. Either they go with a decision of upgrade options as, newer hardware is released or they take this as a pretty serious hit financially. Sony and Microsoft will upset fans if this happens, and AMD will be getting a lot of ire from all sides. Console fans will be mad because of the "holding back of new hardware", while Sony and Microsoft will be redirecting some of the blame also. I doubt they will consider a refund or discount option, because that just leads to more XB One / PS4 consoles sitting around. Unless they have some serious plans to do something with the old hardware, I will just call this a very big rumor at best. If this is true I'm going to be scratching my head, as to what will be the plan to push this as something worth getting? Yes I know there's new hardware under the hood, but why would someone who spent $400-600 on a console want to shell out more on an upgraded model? At least without the option of replacement. Oh good grief. The vast majority of PCs cant do 4k- we arent going to get a console that can do 4k 60 fps at any time in the next 5 years. Arris, SantistaUSA, TopSliceofBread and 10 others like this. It made a bit more sense for earlier consoles to have shorter lifespans, because so many games were coming out for them, but with current gen systems, games are coming out fewer and farther between. "backward compatibility shouldn’t be a concern as they’d still be running on the same x86 architecture." The only problem with this is that the games were programmed to take advantage of very specific hardware. Unless AMD uses the exact same hardware, some level of emulation is going to be required. I think upgrading consoles so quickly is going to hurt their customer base. One of the things consoles had going for them was not having to upgrade every few year. Now there seem to be more hoops to jump through than PC gaming and at a higher cost. Arris and SantistaUSA like this. When a new product hits market, it's successor is already under planning/development. This isn't news. What is news is the possibility that they may shorten the lifecycle of current gen consoles. In any other era, this could be dismissed as rumor. However, the lack of content and consistency of platform performance struggles would suggest there's more than noise to be considered here. Still, though, it isn't even the hardware that's the real issue. It's the games. More specifically, the lack of games for both PS4 and XBO. This backwards compatibility stuff is a time-buying measure so MS and Sony can figure out what their next move is going to be. TopSliceofBread and robb213 like this. Don't care about console war BS. No one cares. If the features of hbm2-gpus are leaps and bounds for next gen desktop gpus, then amd (and perhaps NVidia) will make a console gpu pitch for ps5 and xbox 2. What I don't understand is why consoles don't go for a technology like SLI/Crossfire. They could after 4 years sell a second GPU and you'd attach it and then get that way much more performance for at least another 2 years. In fact old consoles with cartridges did that in a way. The cartridge had components to extend the RAM and other stuff. The PS3 is still a very capable console. Only needs more horsepower. If it was made with addons or replacable hardware in mind there wouldn't be any need to get a PS4. Ideal would be if they go for Desktop GPUs. You could have a gaming pc and then get your GTX960 or whatever out of it and put it into your console and vice versa. Make the games run on a PC too with a client based program. Ultimately get a long HDMI cable and connect that with the TV. 5x more power per watt? I think we'll be in the Zen CPU territory with HBM2.0 memory and a next gen GPU. and the article states that premium consoles have a 7 year lifespan. that is false. besides last gen consoles which lasted 7-8 years, they generally had a 4-5 year lifespan (with only the PS2 having 6 years because the ps3 launched a year late). This sounds like nonsense , the current console's struggle to do 1080 , especially the xbox . There's no way they will be selling a console that can do 4k soon , absolutely no way they can sell at console prices for a machine that can do 4k. Because the only way console games perform as well as they do is because developers are making it for a single set of hardware. Adding another chip to the mix complicates things and makes it harder to make the game as efficient as possible. Might as well just move to a PC at that point. I have no doubt that Microsoft and Sony are working on a new generation of consoles, but I doubt we'll see a finished product anytime soon. And by that, I mean at least a couple years. These things take time. I'm sure both companies will tease us with 4K gaming, and maybe even VR support... but it's all lies. Maybe if they went with Nvidia's pascal architecture, HBM2.0 memory and a filthy quick Intel CPU (Skylake/Baby Cake/whatever), they might pull off 4K gaming (at 30fps), but forget about 4K VR. This would make a very expensive console, and that's not gonna fly with the average consumer. What it comes down to in the end is that consoles are mainstream products, and they will never be anything more than that, because the companies that sell them need to sell as many as possible, and in order to do that, they have to make their consoles affordable to the average consumer. In the end, it's an x86 APU. As long as it is the same, which it is, just a stronger, more capable chip with likely the same instruction set, hence using the same thing instead of changing the whole game (Nvidia, Intel, etc. ), then no, emulation won't be necessary. Now if they change over to something else, possibly. while they can use any x86 cpu and a modern GPU, many games will not work properly without emulation if they make the switch from AMD to NVIDIA since the 2 are built fairly different from each other. Nvidia doesn't even have a GPU with proper async compute engines yet. Using brute force, like we do on PC, won't work as well because of how the APIs are written for consoles. Unless the architectures are compatible with each other we will end up with buggy games and worse than expected performance. I would be really surprised if xbox two and ps5 were not backwards compatible with xbox one and ps4 games. I've lost interest in consols because the one and only series of consoles to offer backward compatibility, Playstation and Playstation 2, got rid of that key feature. I don't want tons of boxes sitting around to play all my games. I've grown attached to Steam. New PC? Just download my Steam games again, no extra box. What's worse... I've noticed a trend with psudo backward compatibility. Sure, I can play my old game on a new console... if I pay for it again as a download. No, you don't get to sell me the same game twice. That doesn't fly. Thats what sony does. Xbox fully supports physical copies as well as digital for the backwards compatibility games. I expect this round to have a shorter than 7 year life cycle - they were underpowered right from the start, but I'd be surprised if they are replaced any time in the next 2 years. I suspect that they both got so burned with overheating and unreliability costs in the last round that they went too conservative this time. I'd love them to release new consoles more frequently, especially if they have backward compatibility, which I expect they both will. Can't beat a console under the Christmas tree to bring out the inner-child!